"No, but I found The Portrait of a Lady a slog for the first 200 pages. After that, I thought it was brilliant and funny." - Marta Acosta, author of Haunted Honeymoon. "I am getting into the last (or last two) books of the Drake Chronicles and so it’s a little intimidating to be closing up a series. There are so many plot threads that need to be cut, knotted or sewn together and so many characters to revisit. And I’m a little sad to be leaving them behind, I consider them friends. That said, I can think of several spin-offs I’d like to explore!" - Alyxandra Harvey, author of Haunting Violet. "Yes. Almost any of the classics. They basically loom up and dare you to get what they really mean, what they're really saying, and scoff at your attempts to grok it. I firmly believe that Dickens snubs me on purpose and Hemingway openly hates my guts." - Dawn Metcalf, author of Luminous. "I’ve tried to read James Joyce’s Ulysses twice now. The second time I got past the halfway point before I had to admit to myself that I hadn’t understood the last fifteen pages or so. I just don’t get it. A Portrait of the Artist as a Young Man was amazing, but I can’t figure out Ulysses. I decided that I’m going to wait another ten years and give a one last try and if that doesn’t work I’m just going to cave and buy the Cliff Notes." - Josephine Angelini, author of Starcrossed. "Thomas Pynchon’s novel The Crying of Lot 49. When I started reading it, I found its chaotic brilliance a bit hard to get my head around. Then about a quarter of the way through, it all came together for me and I was blown away by its sheer magnificence." - Alison Goodman, author of Eona. "Doctor Zhivago. I couldn’t keep track of the names. I’m not making this up." - Trinity Faegen, author of The Mephisto Covenant. "The Bible. I loved reading it and I go back and re-read it every once in a while but I remember looking at that tiny print and thinking about how much meaning was crammed into one book and thinking my head would explode. Then I ended up really enjoying it and what I was able to learn. Come to think of it, that is probably what changed my mind about book length and made me decide that I would read any book length as long as it was a book I enjoyed. The longer the better in some cases!" - Emma Michaels, author of The Thirteenth Chime. "The Hunger Games. It is probably the only book, aside from Pride and Prejudice, that I have ever read and not wanted to change a single word. It's perfect, and the idea of ever writing something so amazing is very intimidating.- Tera Lynn Childs, author of Sweet Venom. "Ulysses by James Joyce. I didn't make it past the first few pages." - Leah Cypess, author of Nightspell. Stop by Thursday to find out if the rest of the authors have ever found a book intimidating. 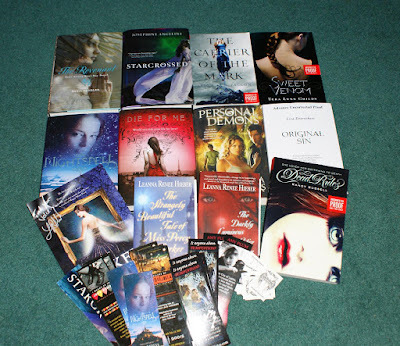 There's lots of great stuff up for grabs this time thanks to the authors and their publishers! There will be two winners and the Grand Prize winner will get first choice of the books and the Runner-Up will get the remaining prizes. See the form below for details. I find books intimidating when they're long. I always think it will take me forever to finish it. Usually the length of a book can be intimidating.